This? 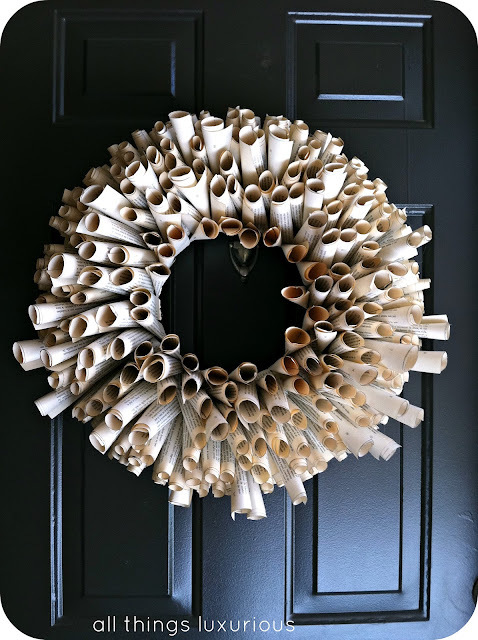 Is a bookpage wreath. A month ago, my husband, his family, and I took a trip to New Jersey to visit some family. One of our stops was his Aunt Lulu's house -- we had so much fun! I had made Lulu a bookpage wreath for her birthday about two months beforehand, and it was hanging up beautifully in her guest bedroom. Grey's cousins Doug and Troy took interest in the wreath, as they were staying in that guest room, and they asked if they could buy one from me and have it shipped to their home in Washington. I was dumbfounded. Someone wanted to pay me to craft? Crazy! When we got home from New Jersey, I immediately set to work on the wreath. Both times I made these wreaths, I used this tutorial as a guideline. Although this wreath is very easy to make, it takes a very, very long time. And for some reason, on this one, I kept messing up, which proved to be very frustrating because I wanted to send this to them in a timely fashion. 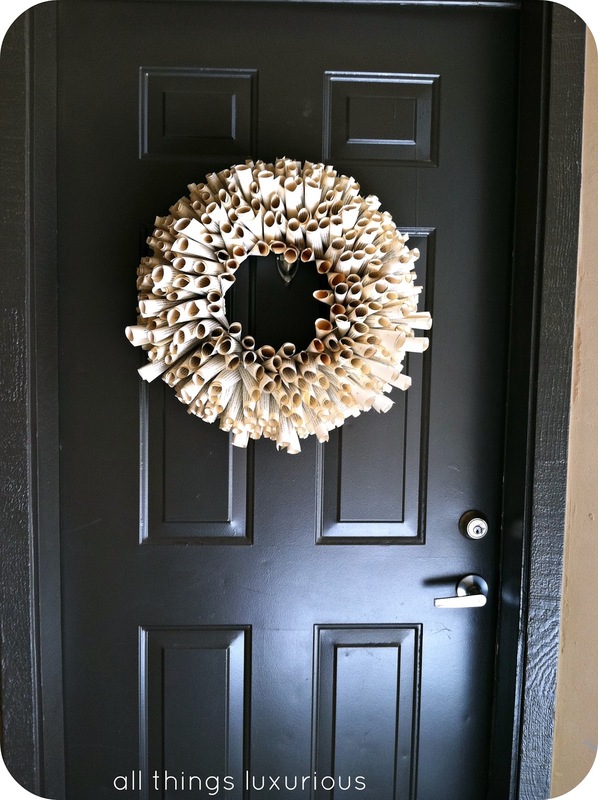 But, the end result was beautiful and I was happy to send this pretty wreath off to its new home in Washington. I walked into the UPS store with a smile on my face and politely said to the man behind the counter, "Hello! I need you to be extra gentle with this and for it to get to Washington as safely as possible." There were quite a few funny stares and the occasional, "Oh, that's pretty," -- but I was happy to hear that Doug and Troy loved it upon receiving it. :-) That's the perfect ending to the story of my first ever sale, I think. 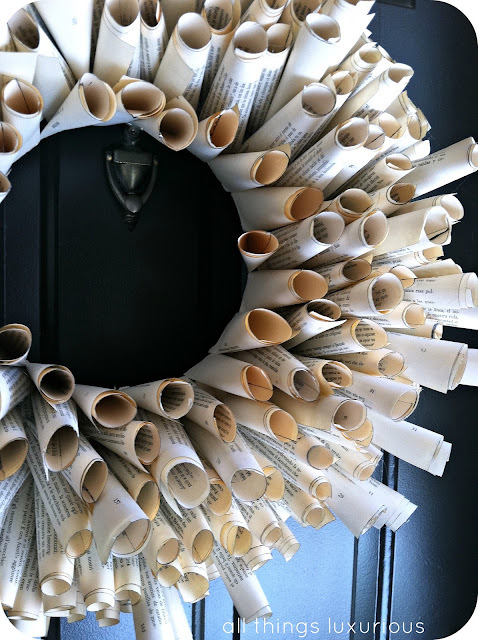 Have you ever made a book page wreath? Beautiful, Maria! I've never made one but I do love them. You did a great job! Hurray for getting paid to craft and do something you love! Thanks! You should totally do it! And with hymn pages? That would be gorgeous! I have never made such a thing but it looks great and it's really original! Thanks! Lindsay from Living With Lindsay did a great tutorial (the link I have in my blog) and she really breaks it down for you and is a great teacher!